The bathroom is not only used for washing. In fact, over the course of the last few years this room has gone in a totally new direction, beyond its functional importance. Today more than ever, the element of water plays an important part in feeling good, with its soothing effect on the body. 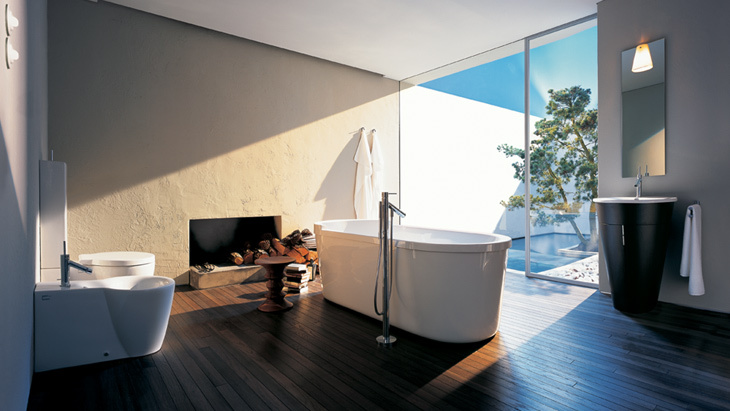 The bathroom is turning into a spacious room where people find relaxation. How can a bathroom turn into a room where you can enjoy spending time? This begins with the individual bathroom elements, which have a homely atmosphere: The wash basin becomes a piece of furniture, the bath tub moves away from the wall and into the room. Clear emphasis on homely elements such as wooden flooring, plastered walls and large windows also contribute to the homely ambience without cluttering up the room. With Axor Starck, the designer Philippe Starck made a revolutionary contribution in 1994 to the modification of the bathroom from functional wet cell to emotive feel-good area.